id Services Australia provides public relations, sales and marketing services to one of Australia’s most unique and talented Indigenous artists. It is with a heavy heart that we advise that Kevin Waina has passed away, Kevin was from Kalumburu, he was a gifted and a wonderful inspiration and joy to be around. Kevin’s work can be ordered through this website. Kevin was highly entertaining. Kevin was also a comedian / entertainer and enjoyed his life to the fullest and loved to make those around him happy! Kevin and his wife, Bernadette, lived at Kalumburu. They have seven children, the three eldest (Cassandra, Melissa and Lawrence) showing the talent of their father. Bernadette is also very well known for her artefacts – her bush buckets made from moulded bark are collectors’ items. Kevin was born at Wyndham in 1954 and lived most of his life at Kalumburu. He visited Kununurra quite often, for Gallery “in house” painting and of course for the Melbourne Cup and Christmas Shopping. He travelled extensively throughout Australia and Overseas – including leading a contingent of indigenous people to Rome to visit the Vatican. When asked why he was chosen as the leader, he laughingly replied “Because if we got lost, I’m the only one cheeky enough to ask the way home”. Kevin was delightful company – he described the Colosseum as “much smaller than I expected”, then went on to compare it with an Australian Rules Football oval – he paced out the Colosseum and knew exactly how many paces that equalled as to the Football oval. Kalumburu is a beautiful spot on the coast in the far north of the East Kimberley – famous for fishing, mudcrabs and oysters. Kevin was in charge of the radio station at Kalumburu – he would broadcast to the Kimberley and Pilbira region, and very often on Monday right around Australia – all via Satellite ex Broome. He was articulate and had a wonderful depth of knowledge of his culture and stories of his paintings and is very willing to share this. 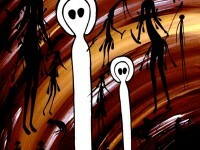 Kevin’s preferred medium was ochre on canvas or bark, and his paintings depict the Bradshaw (Gwion Gwion) rock art which is prolific in his country (Kwini area), combined with the Wallarwhroo, a white figure similar to but very different from the Wandjina figures, in that the Wandjina represents the Rain God – Kevin’s Wallarwhroo directs the hunters as to the best and “allowable” places for hunting and fishing – the hands in his paintings represent the places where his people are not allowed to go. The people bring the Wallarwhroo gifts in return for his direction. 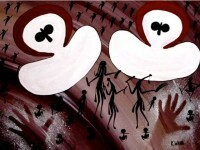 The country in Kevin’s paintings of Bradshaw Art is from Oombulgurri to Kalumburu, including King George Sound. 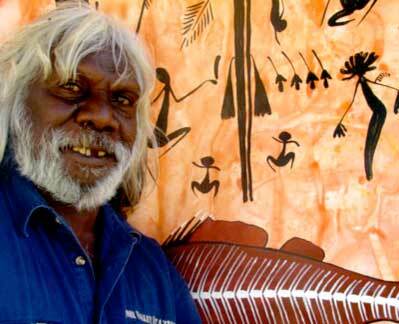 The Wandjina Country is from the Prince Regent area south to Mowanjum. He was very precise about these boundaries. Kevin was one of the best known Bradshaw artists. During his life he had exhibited widely and his works are held in major private and corporate collections worldwide. 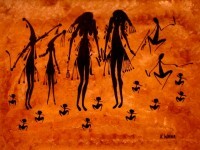 Due to his in-depth knowledge of Bradshaw Art (one of the most fascinating of the rock art styles), he was often interviewed and consulted by the media and experts in this field. In his spare time, Kevin was a muso and played guitar and would sing with the Sunset Band. Kevin was one of my best friends, I along with my family miss him dearly, RIP Kevin!